Little by little, the changes to my laundry/sewing room are on going. half off at Hobby Lobby. to each using black acrylic paint. I used a cushion form for a straight seat back. right over my sewing counter. I'll be adding a few more drop crystals and garland. and I love to see this as I pass by. And yes, half off again. So far the color is all coming together. Neutrals, burlap shades, ivory and black. Well, I am this time!! Normally the cabinets and walls would be first. and merely put the room back together when dry. Sometimes backwards is okay, you know!! 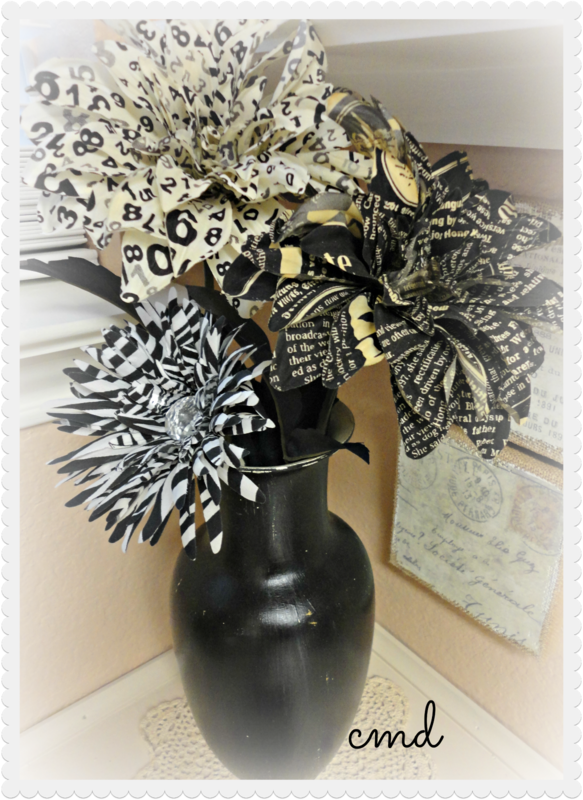 Some wonderful fabric flowers in an old painted vases. And, yes, these flowers were half off at Hobby. Lastly, I found a great Laundry sign for over the sink. And yes you got it, half off again. The sink is another great addition, put in place by my Best Guy. I love the cabinet with storage below. and he painted it the soon to be cabinet color too. That's all I have done in this room for now. I hope to start the cabinet painting next week. what sales are you finding? You are really getting at it for your laundry room! Lovely chair and you did have an easy pillow makeover; it kind of fell into your hands. At the moment I'm not finding any sales... Enjoy your transformation of that room! Wow awesome job Celestina! Love love love that chair! 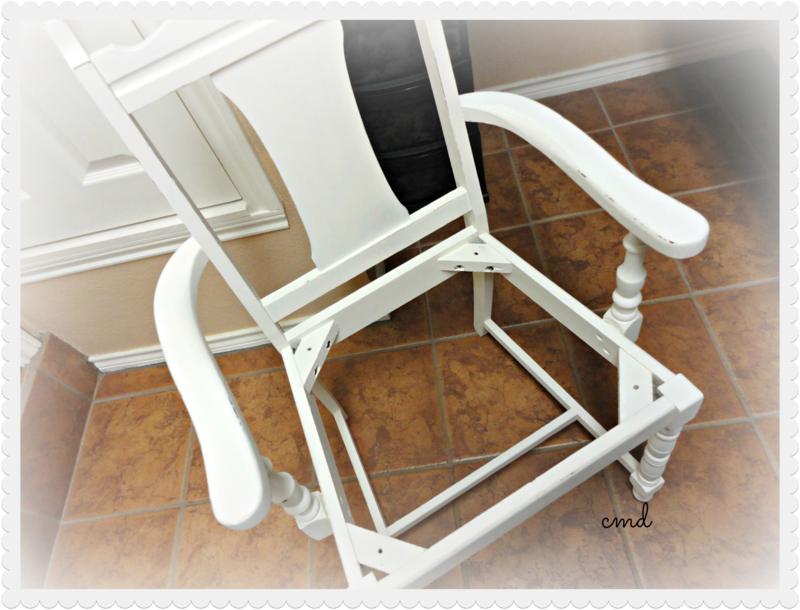 Love the way you did the chair, Celeste! 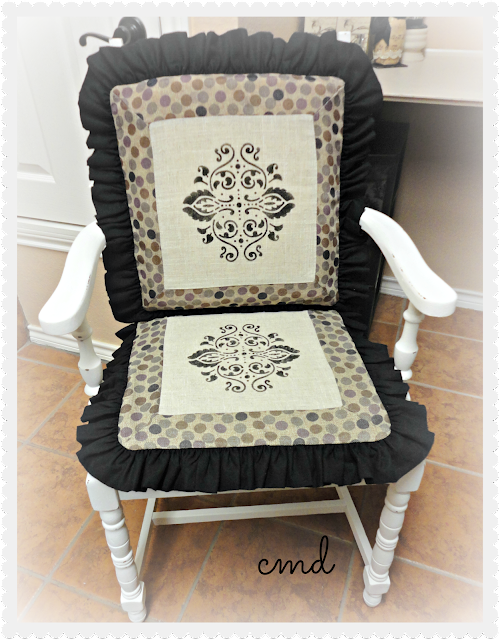 The pattern you added in to the fabric is very nice and I just love the ruffle. You found some great things on sale! Love the storage books and those flowers. It's coming along beautifully! You're only assembling it backwards but you're doing it just as a designer would......finding the things you want to build around first! Designers just have the advantage of buying things all at once and sending in a work crew....now wouldn't THAT be fun? A delightful sewing room/studio is one of life's biggest pleasures. Your looks wonderful and the chair now looks comfortable...well done! Your room is really coming together nicely! I love your chair cushions...the ruffles are wonderful! I do so envy your energy and enthusiasm. I had it once. Unfortunately old age and disability has shooed it away!. Never mind, I can still sit and make pictures. it's coming together beautifully, celestina! 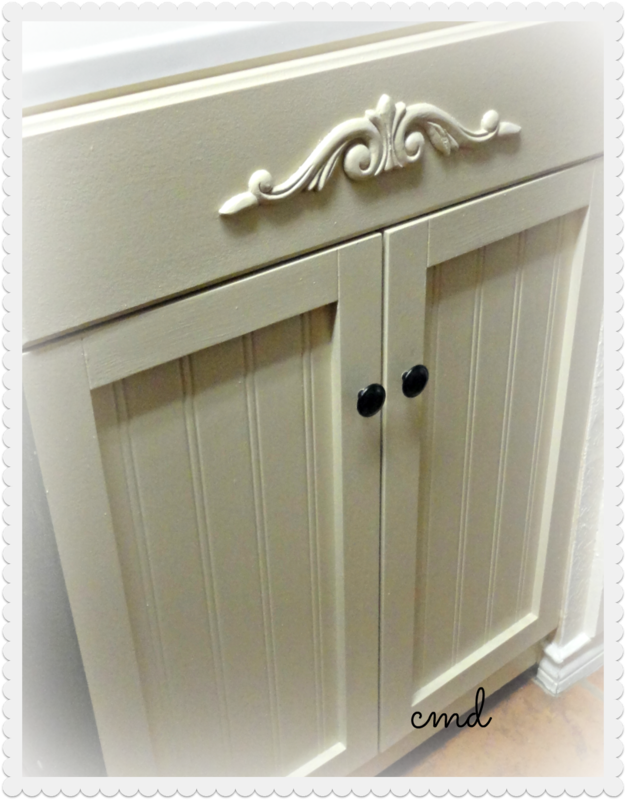 love the cabinet and chair re-do! My house colors all the way! and half off...that is the way to do it girl! What a beautiful laundry/sewing room, Celestina! Who wouldn't want to do laundry in there? :) I love your chair cushions, the polka dots are so fun, and your stencilling is such a great idea! 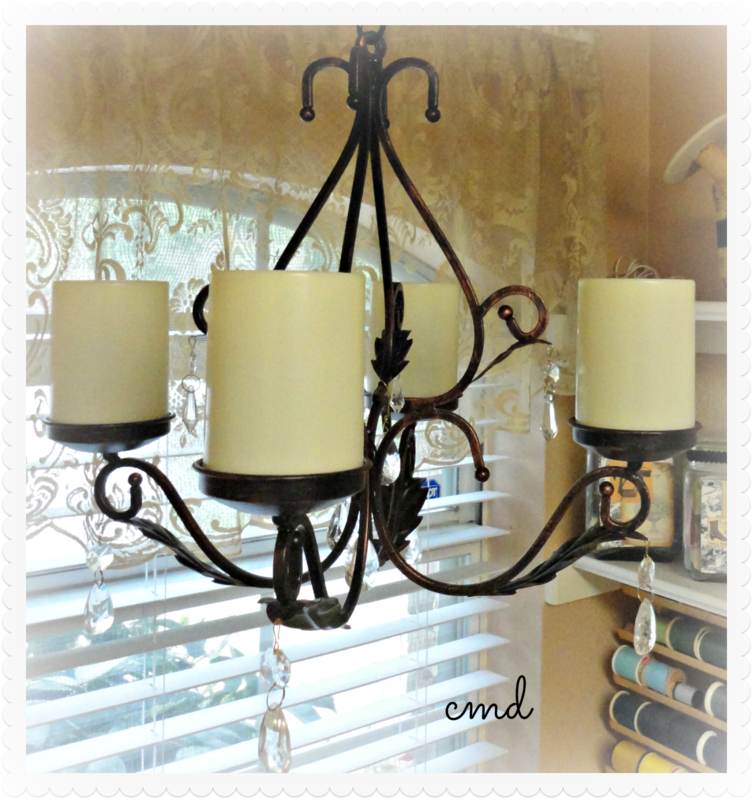 So is your pretty chandy:) Half off is a good thing!! Have a great weekend! 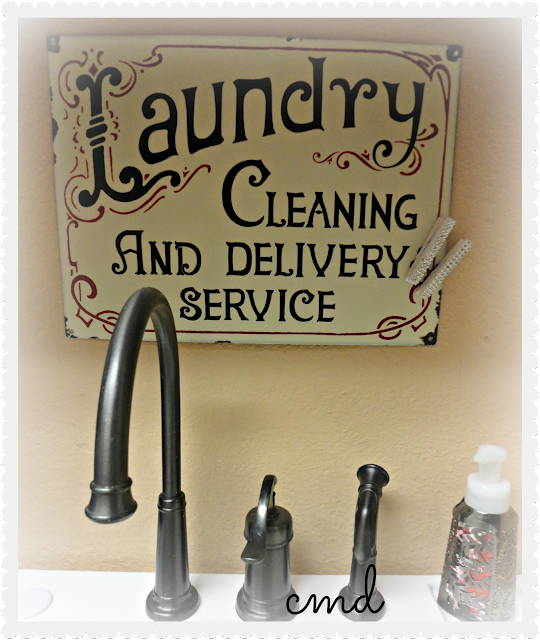 Your laundry room/sewing room is looking great! Love the chair make-over...it is so pretty!! Isn't it wonderful to get things half off...I love when that happens. You've got me hanging waiting to see this reveal! I think it's better to work backwards sometimes and find all your goodies and then match paint colors to them! Love your candelier...I'm a BIG fan of battery operated candles with timers or remotes, I bet it makes that room shimmer after dark! Your chair looks like a million bucks girlfriend!! It looks so comfy and inviting. 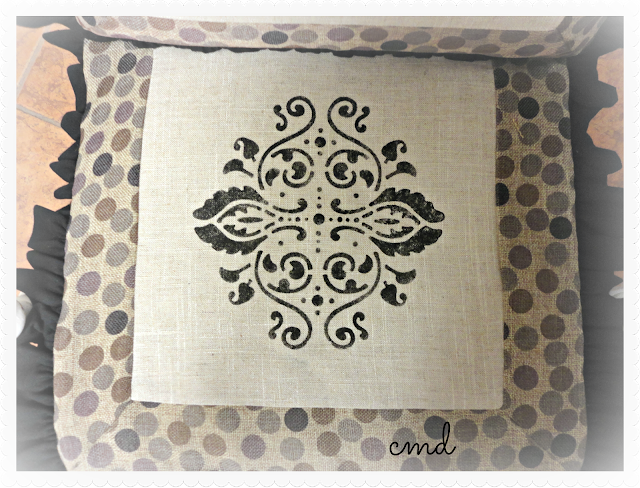 I love working backwards on a room redo and starting with an inspiration piece. It just evolves and comes together into a space you love and feel at peace in. Your laundry room already looked fabulous... now it will be over the top!! I just got caught up reading your last few posts - you have been busy! I love the re-dos you have done with the chairs. 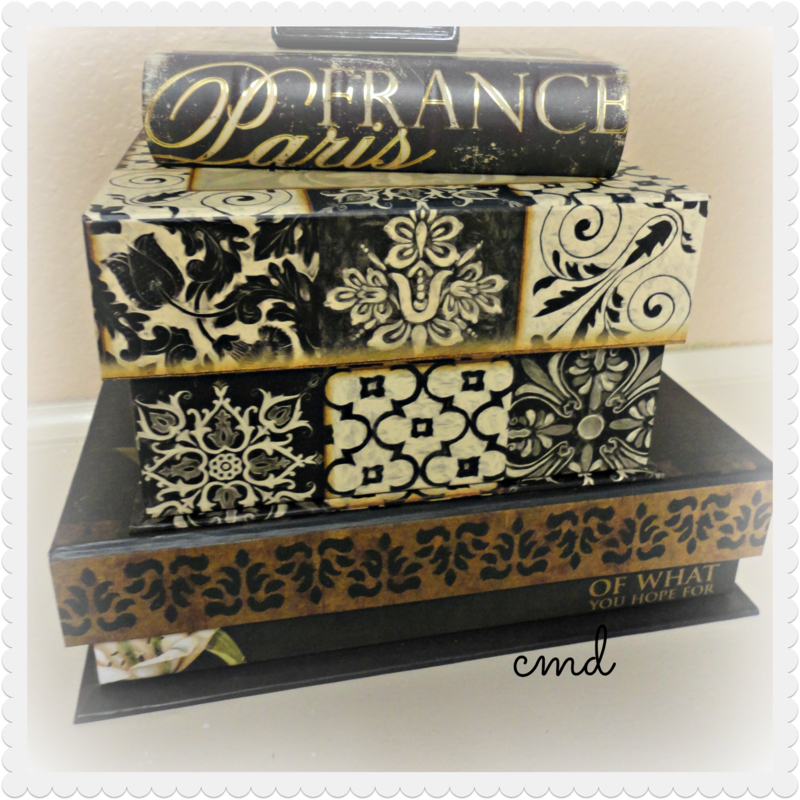 I think you are approaching it all in a splendid way with your half-off shopping...find the things you love that will make the room special and the rest follows along easily enough - it is going to look just wonderful when you are all finished! Celeste, absolutely stunning! 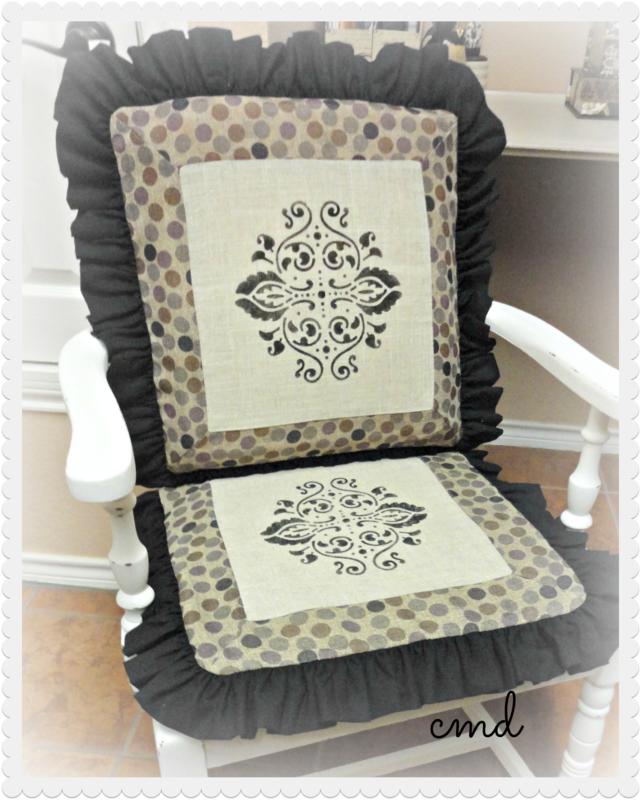 The chair is gorgeous, I love the laundry sign and those fabric flowers are fab! I have been looking for a laundry sign, I think yours is perfect! I hope one finds it's way to a Canadian store. My laundry room desperately needs a facelift. Oh I love everything about this room and all the details! Just delightful, thanks for sharing. Hope you are having a great weekend. Have you been a busy woman or what?! I agree... finding things free or on sale is just the best high! I love being frugal! The seat covers are delightful and WOW! great idea to use those type of candles! I have a chandelier just waiting for those! Hi Celeste, I'm really loving your laundry room, it is lovely...almost too pretty for laundry. LOL But seriously, it is nice to have functional rooms like a laundry room be beautiful too, it is important because we use those rooms so much. Enjoy it. Your reno's always amaze me beyond belief. Blessings and love to you for placing an order with Cynthia to help me. I greatly appreciate your kindness.